Fossmoen is a small village in Målselv Municipality in Troms county, Norway. It is located in the Bardufoss area, about 4 km (2.5 mi) southeast of Bardufoss Airport and the village of Andselv. The village is named after the nearby Bardufossen waterfall. The village of Fossmoen is located about 3 km (1.9 mi) west of the famous waterfall Målselvfossen. 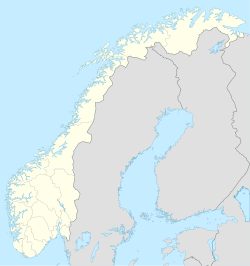 The population of Fossmoen (2001) was 147. The local Fossmotunet folklore museum, which is a part of the Midt-Troms Museum is located here. It is built as a farm from the 19th century, using original buildings from Målselv. The museum is open to visitors only in the summer season. ^ "Fossmoen" (in Norwegian). yr.no. Retrieved 2012-10-08. ^ Statistisk sentralbyrå (2001). "Folke- og boligtellingen 2001, kommune- og bydelshefter 1924 Målselv" (PDF) (in Norwegian). This page was last edited on 20 August 2018, at 00:11 (UTC).